Following a victory at this past weekend’s massive UFC 190 event, women’s bantamweight champion Ronda Rousey has left her belt in Brazil – but for a good reason. 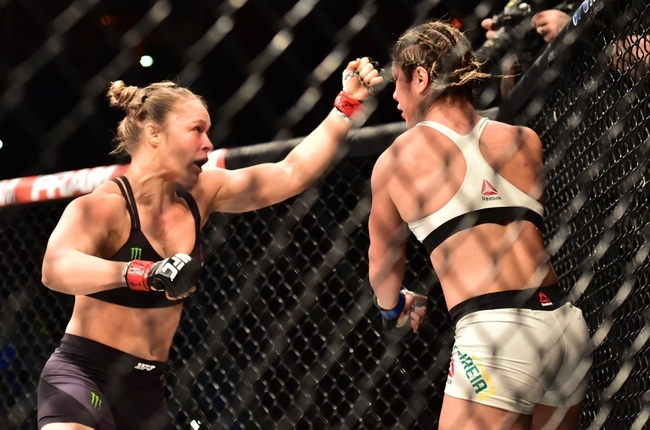 Rousey[/autotag] (12-0 MMA, 6-0 UFC) made quick work of challenger Bethe Correia (9-1 MMA, 3-1 UFC) in the Aug. 1 pay-per-view headliner, which took place at Rio de Janeiro’s HSBC Arena. Prior to her 34-second win (watch the Rousey vs. Correia video highlights), Rousey said she planned to leave the belt in Brazil – since Brazilian-born Correia wouldn’t be able to do it herself. On Tuesday, she posted the above photo (via Instagram) as she delivered her belt to the Reaction Institute, a judo school in Rio de Janeiro. She donated $30,000 to the school, run by fellow Olympic judoka medalist Flavio Canto, in March, as seen below (via Instagram). She first visited the institute in 2014. Dallas ISD police officers learned a form of judo Tuesday. Not the physical kind, but a verbal one to defuse conflicts before they get physical. About 40 officers learned “verbal judo,” a method used to de-escalate conflicts with verbal techniques. They learned to offer solutions to a person who is angry, or make a point of asking for someone’s version of what happened. The training comes as incidents involving police use of force are in the national spotlight. DISD Sgt. Roderick “Tre” Montgomery is trained in verbal judo, and he led the class. Officers engaged in role-play scenarios, such as dealing with a parent who is upset that a child’s cellphone has been stolen. They also practiced using calming techniques, in both their tone and body language. Montgomery advised the officers to try to reach people on a personal level. “A lot of time I tell people my first name because it makes it personal,” he said. Montgomery said police officers also have to slow down and not take the stance that because they are officers they have to be respected. Phrases that can make a situation worse: Calm down. Hey, relax. “Do not use those words,” Montgomery said. Does it matter what armor you choose?